Take a Relaxing Vacation, While You Sleep! LET GO of ALL your limitations and enjoy the HOLIDAY of a LIFETIME as EARLY as TONIGHT! EXPERIENCE the PERFECT HOLIDAY in COMFORT and STYLE! Don't let a little thing like sleep stop you from traveling. Let the power of Lucid Dreaming take you wherever YOU want to go TONIGHT! 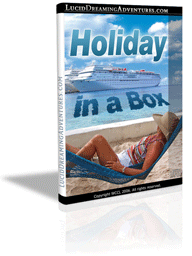 Grab the Holiday in a Box CD TODAY and TAKE A TRIP TO PARADISE! Interested? Purchase YOUR copy of the Holiday in a Box CD today for JUST $28.95. Put the past...in the past!